The Fredericks Company’s Televac® vacuum measurement brand designs and manufactures portable vacuum controllers (also sometimes called portable vacuum gauges, see our handy terminology reference) for use with our 2A thermocouple gauges and DV4 and DV6 thermocouple gauges. We offer two types of portable units; digital vacuum controllers (which have a digital display) and analog vacuum controllers (which have an analog display). What’s a portable vacuum controller? 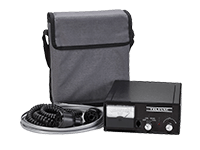 Portable vacuum controllers are scaled down (lighter and smaller), battery powered versions of our standard vacuum controllers that come with a carrying case and coiled cables to save space. They only read from one thermocouple gauge at a time, giving them a range of 1 micron (0.001 Torr) to 20 Torr. They’re most commonly used for low vacuum applications like cryogenic and industrial gas storage and the HVAC market. What are some of the benefits of the 2A thermocouple gauge? The 2A thermocouple gauge has been used in the cryogenic and industrial gas storage industry for decades, testifying to the gauge’s reliability and ruggedness. The filament design and operating temperatures of the 2A thermocouple gauge make it the most contamination resistant passive vacuum gauge offered by Televac. NIST traceable calibration is also available for all of our portable vacuum controllers. Click here to learn more! The VacuGuard is our most popular portable vacuum controller, providing digital vacuum measurements from 1 micron (0.001 Torr) to 20 Torr. It can be used with Televac 2A thermocouple gauges and DV4 and DV6 thermocouple gauges. It can be used with a disposable or rechargeable battery, and it has an optional carrying case. The B2A is the analog version of the VacuGuard, and similar to the VacuGuard it has a vacuum measurement range of 1 micron (0.001 Torr) to 20 Torr. It can only be used with Televac 2A thermocouple gauges and does not run other thermocouple gauges like the DV4 and DV6. It has a rechargeable battery and an optional carrying case.